Property Size 3,051 sq. ft. This fantastic 6 bedrooms, 6 bathrooms Orlando vacation home offers all of the conveniences you'd want for a fun family vacation. The Rainbow House is a two story and includes six bedrooms and six bathrooms. The open-plan kitchen with breakfast nook looks onto the dining and family rooms. The master bedroom has a private bathroom with a walk-in shower and his and her sinks. Additional rooms include a Bonus Room and a laundry room with washer and dryer. The pool area is a great spot for your family enjoy and make special memories to last a lifetime! Accommodates up to 12 Guests with 6 Bedrooms and 6 bathrooms. 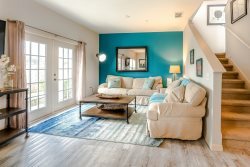 Golf courses, tennis courts, Fitness Center and more; staying in one of the Champions Gate Resort's luxury rental homes near Orlando is like living in your own personal amusement park! THREE championship golf courses surrounding the resort and regulation sized tennis courts, onsite fitness center, and restaurant located in the Clubhouse. Grill your own dinner in the barbecue area, sit by a campfire in the spa grotto, or drink a tropical beverage at our Tiki bar; if you can't find it here, you don't need it. We had a minor issue with water flow in the bathroom and a call to maintenance took care of the issue promptly. The house was awesome, from the cleanliness to the pool and everything else. You get what you pay for and this rental is worth the money.